Serendipidity – it’s a wonderful thing! I discovered Navigatio purely by chance via a Twitter trail, and it turns out that I read it during Read a Novella month too. (Apologies to whoever was running that, I can’t remember who it is that I should mention here). Alert readers will remember that it’s not so long ago that I read Patrick Holland’s novella Navigatio, a glorious meditation that retells the legendary voyage of St Brendan of Clonfert in an exquisite edition published by Transit Lounge. (See my review). Reading Croggon’s book of the same name was not quite the same sensual experience – I had to read it on the Kindle. But on the plus side, it only cost $5.43, which is less than the price of coffee and cake at my favourite café – which is where I read most of Navigatio. (It’s only 111 pages). The Croggon Navigatio is entirely different in focus too. Written in deliberately disconcerting fragments, it tells a story of two migrations centuries apart, in almost alternating chapters. Its hero is not a man in search of a Promised Land; it is women making their way to Australia, their perils magnified by their personal circumstances. There is the narrator telling the story of a migration in modern times, a migration much like mine: three sisters on a journey from Cornwall to South Africa to Australia. This voice is acutely perceptive, noting the fragile marriage of her parents, the mother’s disappointed expectations, the golden memories severed with a wrench by the decision to leave. This biographical (autobiographical?) strand is a journey of the self, exploring the transformations that take place when a new geography intersects with personal history. It’s very beautiful to read because Croggon is a poet. I knew all my childhood that I was my father’s favourite daughter. The betrayals of adulthood, the cruelties and indifference, do not change this, but endow it with the intolerability of paradox. My weaknesses, my fears, my dishonesties, the defining hurts of my life, are my inheritance from him: and these words. Particularly these words. Then there is the story of the voyage of the HMS Fidelis in 1869. ‘Fidelis’ is a Latin word meaning ‘faithful’, ‘dependable’, ‘trustworthy’, a good name for a small wooden ship setting sail from England across vast waters towards the unknown. This narrative is told through multiple voices and one of them is even in two registers. ‘Jackie’ writes to her brother in England, empathetically not only of her own travails but also the difficulties of mothers trying to wash baby things in a bucket and of the convict women confined below. But as ‘Jacqueline’ writing to her husband, she suppresses all of this, giving a glimpse of the pressure to conform to expectations that she will be stoic. There is a harrowing account of a convict’s abuse by her employer in colloquial English, and then there is the journal of the ship’s captain which is preceded by a document entry to the effect that the journal was found in a box at a Melbourne auction house. This entry notes that history shows that the voyage of the HMS Fidelis was a routine voyage with no casualties except for one person who died of natural causes. The journal then begins in the detached observational tone you’d expect, noting the weather conditions and relating the behaviour of others who are trouble makers – but also the somewhat disconcerting appearance of an angel on board. Some saw this merely as an albatross (think Coleridge’s Rime of the Ancient Mariner) but for others it had a profound spiritual effect and there were conversions to faiths of all kinds, from Buddhism to Pentecostal and more. Before long a routine voyage takes on a different quality entirely. There is a massive storm, they are becalmed so long that they lose track of the days, and then a mysterious current leads the ship down into the abyss, where Captain Asterion confronts his own mortality amid his fears for the lives for which he is responsible. This is compelling reading indeed, reminding us that all of Australia’s first migrants confronted similar terrors: mapless oceans, unfamiliar starscapes, unreliable winds and currents, and all too often, a watery abyss. Even today, only the most unimaginative can travel the oceans without awe. Navigatio is a remarkable, adventurous, innovative first novel that leaves the reader with so much to think about that any review can only be a poor introduction to its complexities. 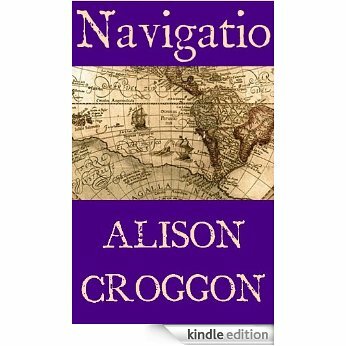 These days Croggon writes for Young Adults and for children, and fantasy novels in a series called the Books of Pellinor, but Navigatio is a little gem well worth seeking out if like me you enjoy subversive literary fiction. Yes, you’ll have to buy it from Amazon. Sounds like my sort of book – I love novellas, for a start, have had Croggon on my general radar for a while, and the historical/spiritual story here sounds fascinating. BUT should I add to my Kindle TBR which now has 24 books waiting for me to read. Like you I avoid reading on the Kindle, then something takes my fancy and I buy it, and file it in the TBR folder/category/whatever Amazon calls it … and there it waits. Hmmm … torn. *chuckle* Far be from me to suggest you should deal with the Big Behemoth, but yes, you should buy this one because (a) you would love it and (b) it would only take you five minutes to read and (c) you would write about entirely different aspects of it in your review and I would love that! Good try Lisa! I’ll see! It’s a really remarkable book. The last one or two chapters are astonishing. Well said, Jane. A very sophisticated debut indeed. I agree with you about serendipity! Two very different sounding novellas with the same name – they both sound interesting. I enjoy reading ebooks, but bought a Sony reader some years back, rather than a Kindle, and now feel somewhat disadvantaged. So many books are only available on Kindle. LOL I’ve had the same problem the other way round. Mind you, if your eReader is a few years old, you might be tempted by a new Kindle. (A-hem) my puppy chewed the charging lead on my old one, damaging the slot the lead went into so I had to buy a new one, and have been pleasantly surprised. It’s got touchpad technology, and is smaller and lighter and therefore more handbag friendly. And now that there is an Amazon Australia store, it’s much easier to find Australian books than on that clunky American store. So while I don’t like supporting them and would rather read a print edition any day, the example of this book, resurrected by its author, shows that there are times when putting my prejudice aside can benefit Australian books and writing. Thanks for the tip. I’ll think about getting a new Kindle. I hope your puppy is past the cable chewing stage! Cables yes. Corners of the Kindle cover, no.